I am definitely a sucker for anything that is pet/animal related...and BirdyBrooch does not disappoint. Handmade with love all the way from Russia, BirdyBrooch is a line of handmade delicate Bird brooches. Not only is there a colorful array to choose from, but you can also contact them for a custom made brooch as well. 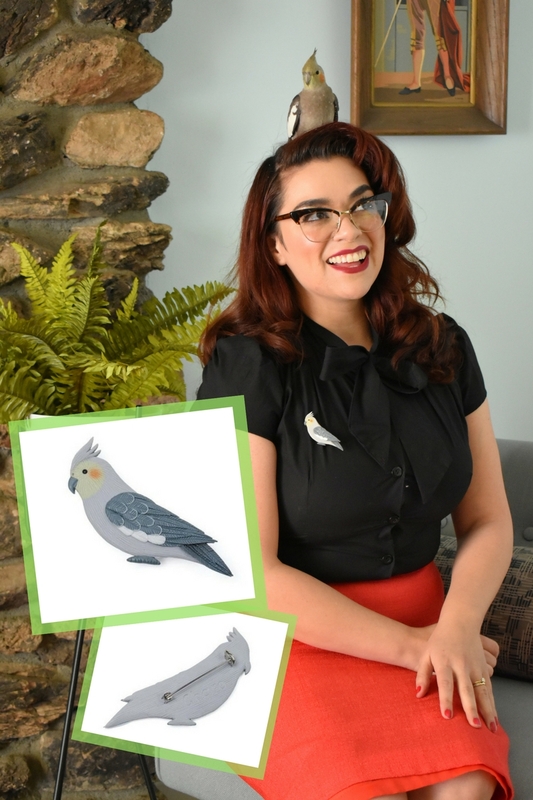 They create custom brooches of your birdie pal with just a picture as reference. Custom made brooches are by custom request only, with prices depending on the detailing and size. I couldn't resist getting a brooch made of my little Charo, our latest rescue, a cinnamon cockatiel. I have never had anything created like this before, so I was very excited! I was floored when the brooch came in the mail. Shipping was better than I expected considering being shipped all the way from Russia. The detailing was impeccable. There was a sweet final touch of Charo's name beautifully etched in the back of the brooch. Take home your very own little birdie brooch at www.birdybrooch.com !